The two unbaptized babies of Joseph and Mary Ann Jesmer. Children no. 13 and 15. Joseph and MaryAnn lost two children in infancy. On the west side, near the edge if the cemetery, is a small white faded gravestone. It is one foot high and rounded. 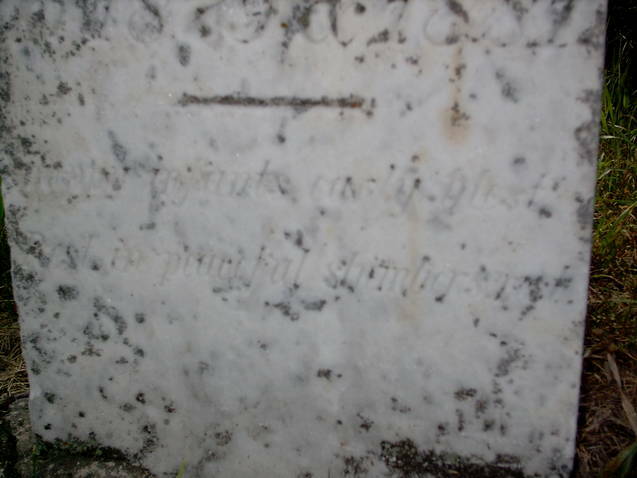 The top of the stone is faded and can not be read. The bottom says, “the children of J&M.A. Jesmer 1881 and 1879.” (not included in the St Edwards Hx book) On the gravestone they have a popular epitaph which reads, “Happy infant, early blest, rest in peaceful slumber rest”. Obviously their Catholic faith meant a lot to them. It also shows their faith. They felt that their children, passing on in infancy, was being “blest” by God because they will be with Jesus forever in heaven. The child born in 1879 is the 13th child and the child born 1881 is the 15th child. According to a newspaper article, on 4/27/1879, Joseph and MaryAnn, had a baby born in Greenbush, but he/she died two days later. There was a diphtheria epidemic in the area at the time. On 3/2/1880 Maggie Robideau, Nelson A. Jesmer’s cousin, died at a young age of diphtheria. The babies are buried in the Greenbush Cemetery, near Princeton MN. Before St Edwards Catholic Church (Princeton, MN), the Catholics in Greenbush Township went to the Greenbush Catholic Church. The French-speaking community in Greenbush- most from Franklin Co, NY & St Regis, Huntingdon Co, Quebec – donated land to establish this church, and all of their sacraments were performed here. The church was razed in 1948, and all that is left of this small parish is the Greenbush Catholic Cemetery. Why would the babies be buried on the edge of the cemetery? Maybe an article from Belfast Ireland can shed some light on this practice. Archaeologists began searching Tuesday for unmarked mass graves containing hundreds of unbaptized babies and infants buried by the Catholic Church on the edge of a Belfast cemetery. Unlike many other Christian churches, the Catholic Church teaches that baptism is essential for a soul to enter heaven and therefore the ritual must take place as near to birth as possible. For decades, newborns and infants who die before baptism were deemed ineligible for salvation and were not buried on consecrated, or holy, ground. Individual priests in Belfast began loosening that restriction in the 1980s as families demanded the right to bury their youngest loved ones in marked family plots. Although Catholics have long believed that children who die without being baptized are with original sin and thus excluded from heaven, the Church has no formal doctrine on the matter. Theologians long taught that such children enjoy an eternal state of perfect natural happiness, a state commonly called limbo, but without being in communion with God. In 2007, Pope Benedict XVI reversed centuries of that teaching by approving a report by the International Theological Commission, a Vatican advisory panel, that said there were “serious” grounds to hope that children who die without being baptized can go to heaven. The report stressed that none of its findings should be taken as diminishing the need for parents to baptize infants. The records of Milltown Cemetery in overwhelmingly Catholic west Belfast indicate that hundreds of unbaptized newborns and infants were interred in unmarked mass graves on the western edge of the cemetery – land that the church sold nearly a decade ago to a nature reserve. Since October, mothers and other relatives of a few dozen of the dead infants have protested at the cemetery fence. The families,under the umbrella name Relatives for the Milltown Babies, are demanding that church leaders apologize, identify the grave sites, and return the land to the cemetery with new grave markings. That is a separate question from unbaptized babies not being buried in consecrated ground.I believe that may have been a decision of the pastor, and not Church practice, but I may be wrong. It was never the official teaching or practice of the universal Church to prohibit the burial of non-baptized people in consecrated cemeteries. It was, however, the practice of individual bishops and pastors. The answer is that yes, they may have a Christian burial, but if they are unbaptized there is to be no funeral Mass, although there may be a memorial Mass. I did the graveside service for the stillborn granddaughter of one of my brother deacons. Apparently there have been some changes in the practice since 1881. The Church has revamped a lot of 400 year old rules just after 1962. If the parents had intended on having the baby baptized and he/she died, canon law allows for a Catholic funeral. People need to take instructions from the priest, not the neighbor down the street. May unbaptized babies receive a Catholic funeral? What about miscarried babies? If a child’s parents intended to have their child baptized but the child died before the sacrament could be administered, the local ordinary may allow the child to have a Catholic funeral (cf. Canon 1183.2). What would compel Catholics to bury unbaptized babies at the edge of a cemetery? It has to do with the theology of LIMBO. The Roman Catholic church teaches that there are two main permanent locations or states after death: Almost everyone will spend eternity in either Heaven or Hell, depending on their salvation status at the instant of their death. Simple justice would imply that unbaptized newborns and infants would not be tortured in Hell. However, the Church has long taught that children suffer from Original Sin when they are born. Until 2007-APR, the Roman Catholic Church had never made an official statement on the fate of embryos, fetuses, newborns and infants who die before being baptized. Some theologians have taught the existence of a place or state called Limbo which is intermediate between Heaven and Hell. Belief in Limbo has been suggested by many popes and Catholic authorities down through the centuries. It has never been an official belief promulgated by the church. During 2007-APR, the Catholic Church issued a statement on the fate of unbaptized infants. It still gives no definitive answers. Many parents are apparently distressed about the fate of their miscarried embryos, miscarried fetuses, and infants who die before being baptized. They must remain in a state of great anxiety in the hope that some future proclamation of the church will settle the issue. Considering the number of people who die as newborns, infants, and young children, the agony felt by believing Roman Catholics must be immense. Christians hold that Heaven is a state of union with God, while Hell is separation from God. Christians have long wrestled, however, with the conundrum of what happened to those who lived a “good life” but died before the time of Jesus, as well as the fate of children who die without being christened. The answer since the 13th century has been Limbo – from the Latin limbus, meaning a hem or boundary – held to be the temporary resting place of “the souls of good persons who died before the resurrection of Jesus” (limbus patrum, or Limbo of the Fathers) and the home in the afterlife of “those who die in infancy without having been freed from original sin” (limbus infantium, or Limbo of the Children). St Thomas Aquinas described the “limbo of children” as an “eternal state of natural joy” in which unbaptised children were unaware of the greater joy of Heaven. The concept was given papal authority by Pope Pius X (1903-1914), who in his Catechism declared Limbo to be a place where the unbaptised “do not have the joy of God but neither do they suffer…they do not deserve Paradise, but neither do they deserve Hell or Purgatory”.